With this project/application, you can make a light sensor dependent lamp. 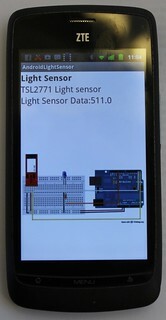 You can make a light sensor or dark sensor with this application. The light sensor of your Android smart phone senses ambient light present in your room and sends commands to Arduino board. 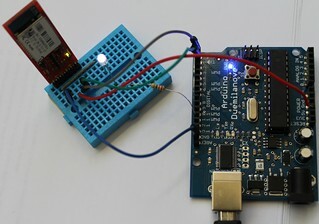 Your Arduino program determines the behaviour of the LED, whether it should glow bright or dim. You can also see the light sensor data on the smart phone interface. If you have never worked with Amarino before, I strongly recommend you to visit www.amarino-toolkit.net and try the basic projects published on that site. This project is completely based on Amarino API, Meet Android– Arduino Library and the previously mentioned articles. Read about Meet Android Library. This “QR Code” allows you to use a mobile device to easily scan this URL to download this file onto that device. Connect an LED and Bluetooth Module (BlueSMiRF mate silver) to Arduino. See the pin configuration of BlueSMiRF mate silver module. 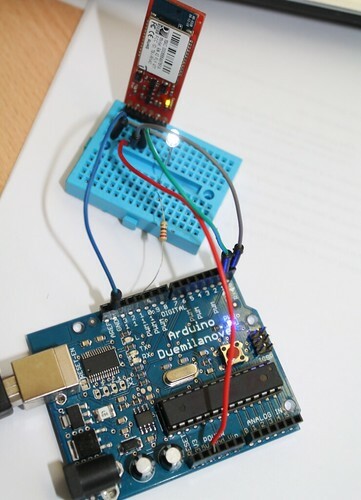 a. RX of Bluetooth module- TX of Arduino. c. VCC- 5V of Arduino. Your circuit picture is wrong. You show the ground connected to 5v, and you don’t have the Vcc connected at all. You don’t have a resistor on the LED which would be fine if you used the internal resistor in pin 13, but you aren’t. I have corrected the layout.